Visibly angry and hurt over the allegations of corruption hurled against him by Team Anna, Prime Minister Manmohan Singh on Tuesday lashed out at the group stating it was "unfortunate that irresponsible allegations were being made" against him and 14 of his colleagues. Manmohan Singh asserted that he was prepared to "give up my public career" if any of the charges levelled by Team Anna were proved true. 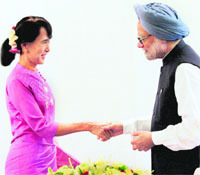 It was perhaps the most anticipated meeting of Prime Minister Manmohan Singh�s landmark visit to Myanmar. For ever since Aung San Suu Kyi was first placed under house arrest by the military junta in 1989, no Indian head of state had met her. It was expected to be a routine affair. But the Congress Legislative Party (CLP) meeting today witnessed a high drama with leaders accusing each other of undermining the party. 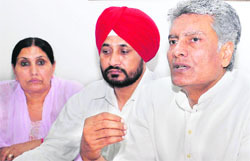 Falling in line with the Supreme Court�s directive, veteran Congressman Narian Dutt Tiwari today gave his blood samples for DNA profiling in a paternity suit filed by Rohit Shekhar, who has been claiming that the octogenarian leader is his biological father. The Government today said it would move the Supreme Court as soon as possible to seek review of the Andhra Pradesh High Court pronouncement quashing the Union Cabinet�s decision to approve 4.5 per cent sub-quota for the minority Other Backward Classes (OBCs) within the 27 per cent reservation available to OBCs in central government jobs and educational institutions. India never forgets its enemies, but sometimes has difficulty remembering its friends like the recently deceased British mountaineer who risked his life to gather information about China�s military build-up in the Himalayas. In a move that could spell trouble for politicians, bureaucrats and top cops involved in grabbing land across Punjab, the Punjab and Haryana High Court today directed the constitution of a three-member tribunal.